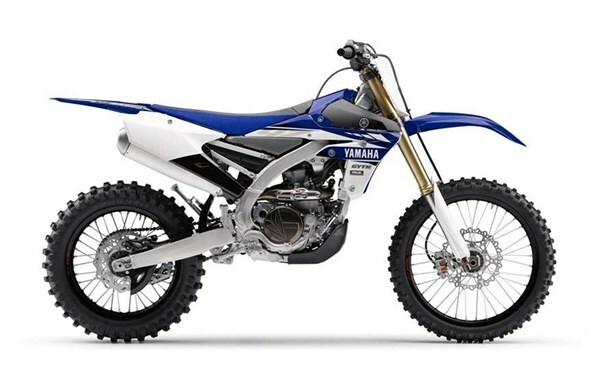 Click the button below to add the 2017 Yamaha YZ450FX to your wish list. Simplified Servicing: Redesigned air cleaner cover provides tool-less access to the air filter, positioned at the front of the bike to avoid roost from the rear wheel. Updated Indicators: Thanks to a new WR-style fuel level sensor in the tank, the 2017 YZ450FX includes convenient fuel level and engine warning indicators on the handlebar. Revised Shock Tuning: The rear linkage and KYB® shock provides 11.6 inches of travel with adjusters for high- and low-speed compression damping, rebound and spring preload—and features a large piggyback reservoir for excellent damping and fade resistance. 270mm Front Brake: 270mm front brake system provides exceptional stopping power and braking control. Sealed O-ring Chain: High quality O-ring chain is tough and durable.